It's sometimes hard to estimate how long a tattoo will take to heal, but there are many ways to prevent healing from becoming a drag. All of our tips and tricks below should help to ensure healing times are kept as short as possible. We'll explain how long an average tattoo takes to heal, and the many factors that come into play when determining healing times. 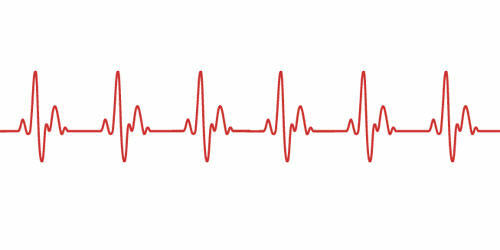 On average, it normally takes around 2-3 weeks before you can take a long bath, go swimming, or relax in a hot tub. 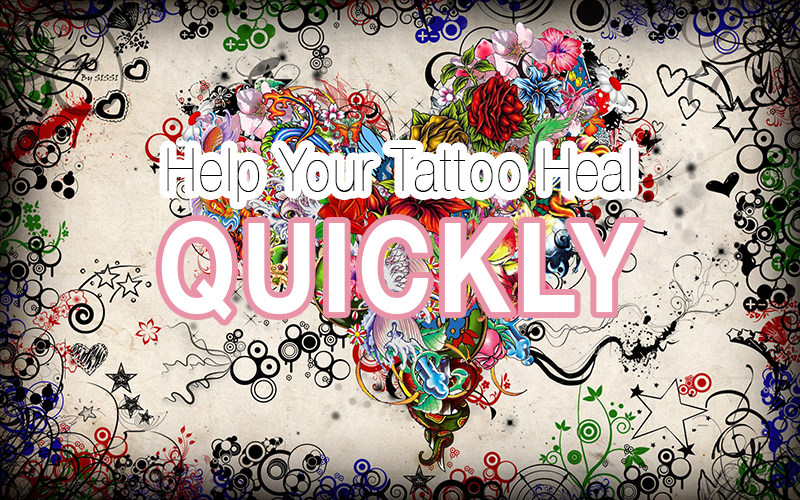 Healing times will also depend on how well you look after your new tattoo and the area of skin surrounding it. 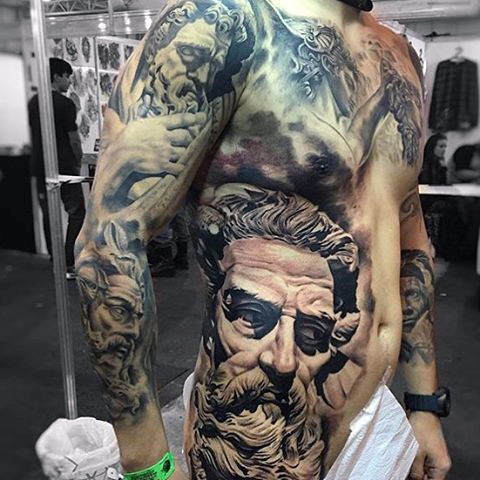 In general, complete healing of all layers of tattooed skin usually takes up to 4 months. In terms of appearance, your tattoo should look completely healed within 2-3 weeks, although it may appear slightly shiny and scaly for several more. This is as long as everything goes well with no infections or extreme scabbing taking place. The skin below the surface, however, generally takes longer to heal. As mentioned, this can take up to 2-4 months. This is why getting tattooed over the same area can be much more painful the second time round if not enough time has elapsed between sittings. Everybody is different. Everybody has their own unique skin properties and immune systems, so no two people are ever going to heal in exactly the same way as each other. As with most questions, there are many variables that affect the answer – and with this specific question, no single answer is correct. 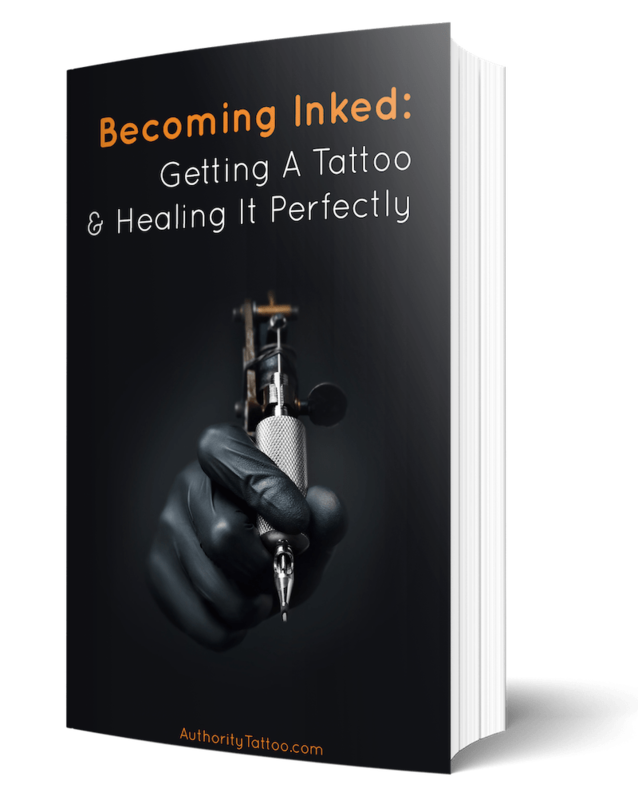 However, continue reading and you'll discover what you can do to make sure your tattoo heals as well and as quickly as possible. 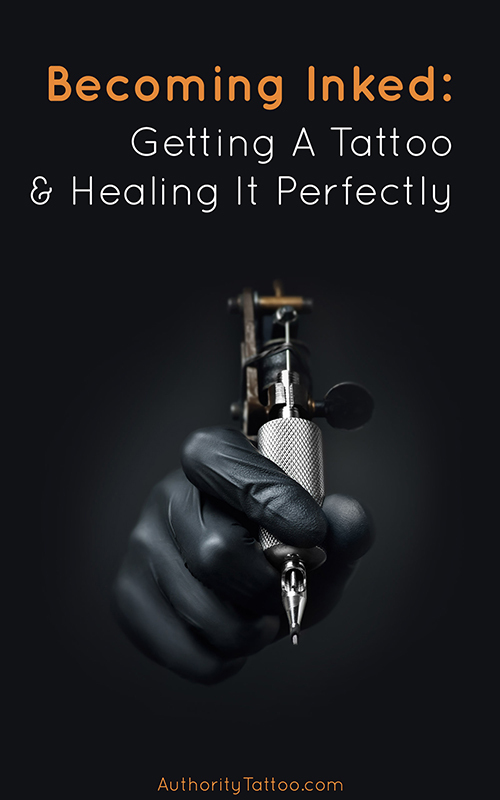 There are many factors in play that can determine the times of your tattoo healing process. Take each of the below factors into consideration, and you'll have the best chance of healing your tattoo as quickly as possible. One of the most essential things to remember when your tattoo is healing is to NOT pick the scabs off, no matter how tempting. This also goes for pulling off pieces of peeling skin. 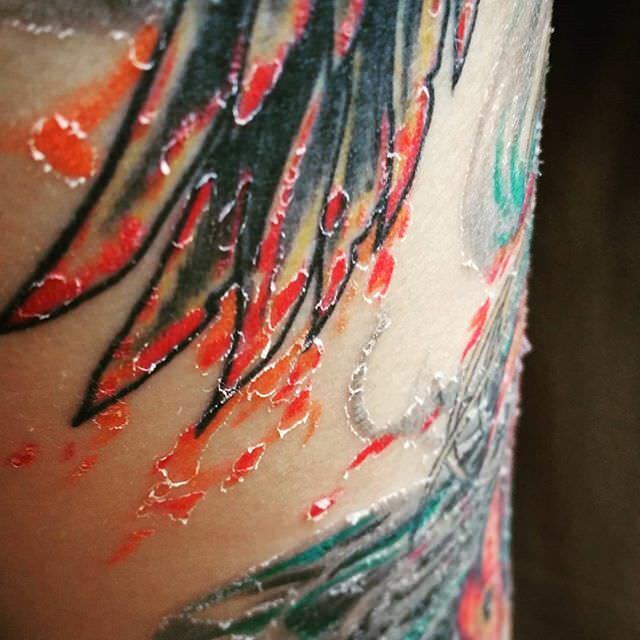 Heavy scabs that are not yet ready to fall off are still forming deep enough into your skin to effect the layers in which the tattoo ink has been set, meaning that pulling a scab off prematurely can pull ink away from the area, potentially leaving pits and colorless spots in your skin. Pulling thick scabs away can delay healing times considerably, and will potentially cause your tattoo to require extra touchups from your artist if any color is lost. Although some scabbing is common on new tattoos, especially bigger and darker pieces, heavy scabbing covering large areas of a tattoo is not normal, and this could mean your artist may have been too rough, and/or went too deep with the needle. Go back and see your artist for advice if the scabbing is excessive. The same goes for peeling skin. This stage of healing can be very uncomfortable, with large areas of half-dead skin hanging from your tattooed area and varying bouts of itching (dependant on factors such as skin dryness). Read our great guide here on how to stop your tattoo itching. Just remember that this stage only normally lasts for several days, so try and see it out by letting the skin fall off naturally without pulling it off. Peeling skin off that isn't yet ready to fall off can pull ink from the skin just like scabbing can. As you wash your tattoo daily in the peeling stages, you will likely see pieces of colored skin falling off as you rub the area with soap/water. Some people worry about seeing this as they are concerned they are pulling ink out. This flaking is completely normal. As long you’re not too rough while washing, the skin that does pull off should have been ready to fall away anyway, and will naturally contain some small traces of ink, which is also totally expected. With personal experience, most of my peeling skin seems to come off during the cleaning process, and all of my tattoos have come out perfectly okay, so don’t worry! Although not necessary by any means, applying a good aftercare lotion helps to speed up healing by keeping your tattoo nourished and well-moisturized. Don't overdo it, though. You should only need to apply lotion after each time you wash the area, so around 2-3 times per day depending on how clean you can keep your tattoo between washes, or whenever your tattoo looks/feels very dry. What you most not do, though, is smother your tattoo in a thick layer of lotion. While the skin is healing, it needs to breath, and a 1-inch thick block of tattoo cream isn't exactly going to help the process. This can delay healing and cause your tattoo to bubble up. If you accidentally ​apply too motion lotion/ointment/cream, simply gently dab off any excess until there's only a very thin layer remaining on the tattoo. As mentioned, lotions and ointments aren't required, but can definitely help towards speeding up the healing process and ensuring the tattoo looks clear and bright afterwards. Cleaning your tattoo – This should be done with sensitive, fragrance-free soap and lukewarm water (your skin will be very sensitive and hot water can cause the skin to swell and rash). Cup the water with your hands and pour it over your tattoo. Gently rub the tattoo with your fingers in a circular motion. 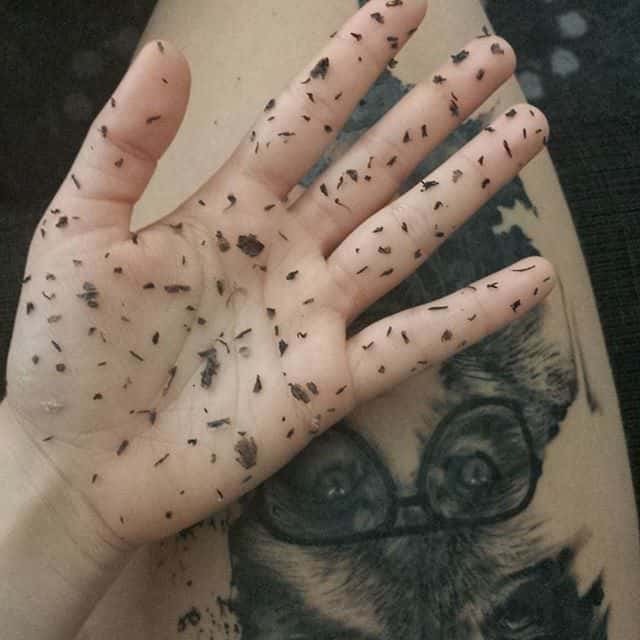 More here on how to clean your tattoo correctly. Showering - Try not to keep your tattoo in the firing-line of the shower-head for too long, and try to limit your showers to below 5 minutes to prevent water and steam sweating the ink out. Pat the tattoo dry afterwards, do not rub! Bathing – After sitting in your bathtub for just a few minutes, the water will be harbouring with bacteria and can easily cause an infection in your tattoo. Avoid baths for at least 3-4 weeks. Swimming in pools – Although bacteria is killed by chlorine, the chlorine itself is very damaging to new tattoos. It can dry out your skin, potentially cause a rash on sensitive areas, and can fade/draw the ink out of deeper layers. Stay out of swimming pools for 3-4 weeks. Swimming in the sea – Like with chlorine, sea-salt will dry your skin out and can cause irritation. Stay out of the sea for at least 3-4 weeks. Lakes and other bodies of water – This is because there are many horrible types of bacteria festering in most large (and often small) open bodies of water. Stay clear for at least 4 weeks. This can be a serious tattoo killer. Nothing is more harmful to your tattoo than the almighty big ball of fire – especially when the tattoo is fresh. Your skin will be extremely sensitive to UV rays during the first couple of weeks, and any sun exposure for more than a few minutes can cause skin irritation and burns; and trust me, sunburn on a new tattoo is not fun. Expect a large delay in healing if this happens to you. 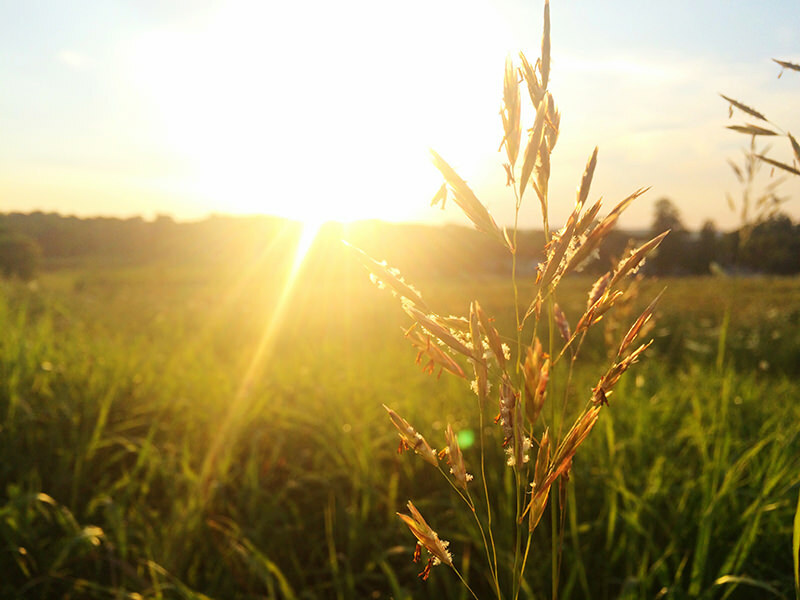 Check out our post on how to have fun in the sun without worrying about damaging your tattoo. Depending on where on your body your new tattoo is, various materials are going to come into contact with, and rub against, the tattooed area. Any prolonged or vigorous rubbing over recently tattooed skin is going to be detrimental to the healing process and will most likely prolong recovery somewhat. It is not only the rubbing motion that can irritate a tattoo, but also the material itself. 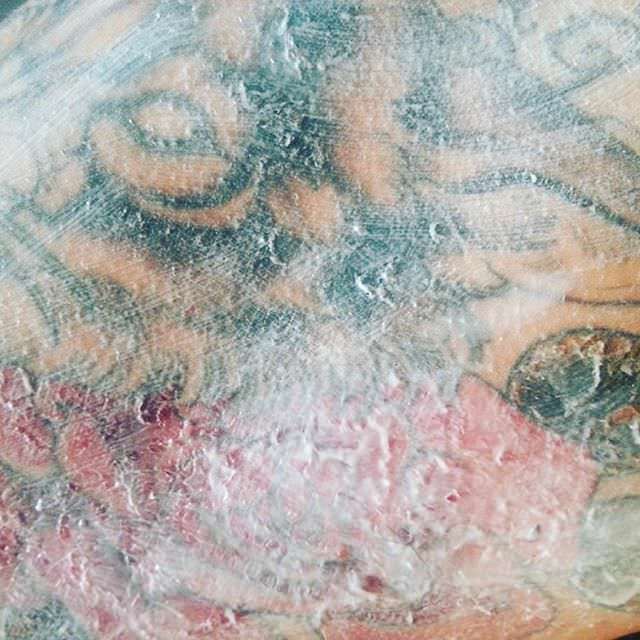 Recently tattooed skin is going to be much more prone to irritation, and you may find that certain materials (such a latex, for example) that do not normally cause irritation, can quite easily bring tattoos out in a bright rash if left in contact with the skin for any extended periods of time. Wear loose-fitting/baggy clothing over your tattooed area whenever possible – not only does this reduce the likelihood of rubbing, but it also allows the tattoo to breath more effectively – potentially speeding up healing times. If the tattooed area does become irritated by rubbing against a certain material, uncover and wash the area with fragrance-free/sensitive soap and warm water as soon as possible This should sooth the aggravated area. Feet – Probably the worst place to get a tattoo if you have an active job. It’s pretty much a given that you’re going to need to take it easy for a few days and not wear any socks or rubbing footwear. You may get away with sandals depending on the exact placement of the tattoo, but if not then it might be best to call off work for 2-3 days to let the initial healing take place as effectively as possible. Shoulders – These areas of upper-body clothing are usually the places that hug against your skin the tightest. There’s not much you can do about this except trying to find the loosest possible clothing to wear. Try not to wear any materials that may irritate the area such as latex, leather, or rubber, as these will cling to the tattoo. These materials can also cause excessive sweating, which may draw ink out. Bottom/Upper Legs – Tight wearing denim is your enemy, especially as these places naturally tend to rub against your clothing. Try to wear a more breathable/looser-fit material for a week or two - and sit down carefully! Back – This area is mainly problematic when sitting down on a chair/sofa with a backrest. Over time, this can press your clothing against your tattoo and can potentially cause sticking. Try to remember to move often, and refrain from sitting against a rest for too long. If a piece of clothing does manage to get stuck to your tattoo, DON’T just pull it off! This can cause a scab to loosen/break away, potentially causing scarring and/or ink loss. Get a cloth and soak it under warm water, proceed to dab the stuck area with warm water until the clothing pulls away with no force required. There are many parts of your body that naturally rub against other parts all day long – think inner thighs, fingers, and under-arms. All of these places naturally rub against other body parts on a regular basis. This, just like clothing, can also cause irritation, and any skin-on-skin contact should be avoided as much as possible. Obviously, I’m not telling you to wobble about in a squatting duck position to prevent your thighs from slapping together, but try and be as proactive as possible. If you know you’re getting your tattoo done in an area that is likely to rub in your day-day activities, take 2 or 3 days off to rest, and let your tat heal irritation-free for a while before going back to your normal daily life. Being tattooed in/over/around joints can also be a bit of a nuisance. Places like the wrist, inner elbow and neck are constantly on the move, meaning that when a tattooed area tries to scab over and grow new skin, these areas are constantly being broken down again due to the skin twisting, stretching and pulling. Now, I'm not asking you to start straight-arming all of your drinks at the bar, but try and move your tattooed joints as little as possible. It’s tough for a week or so, and joints do generally take longer to heal than other areas, this can’t be helped, but try to keep movement as minimal as possible. For example, if you've gotten the ditch (inner elbow) of your dominant arm recently covered, try brushing your teeth, combing your hair and doing ‘other’ (ahem) activities with your less dominant arm. Warning; doing some of these may be tougher than you think. It’s well-understood that color tattoos do generally take longer to heal than B&G (black and grey) due to the contents of the ink. All colored inks contain very small amounts of metal that the human body finds hard to accept. Some people react worse than others to these metals, and in some situations the body can actually push out some of the ink, increasing healing times and prompting a tattoo touch up from your artist. Out of all the colors, red ink causes the most adverse reactions to healing by far. This is due to the makeup of the ink compared to most other common colors. Please bear this in mind, as if you are one of the unlucky people to have an unfortunate reaction to red ink, your tattoo may take a while longer to heal, and may even turn out a little patchy-looking due to your body trying to expel the unwanted ink components. 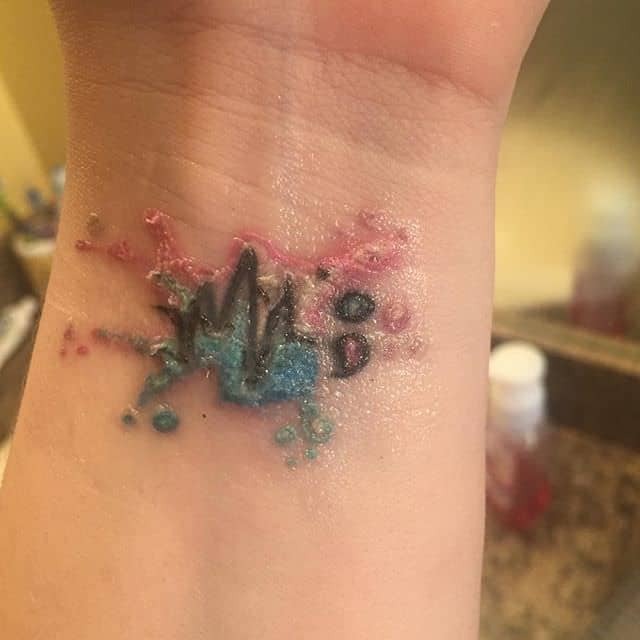 You have to remember that no-matter how popular and common tattoos are these days, they are still essentially large open wounds caused by trauma carried out over long lengths of time (having needles passed in and out of your skin thousands of times in a single sitting injecting a foreign substance into your body). Therefore, as with recovery to all other types of damage your body goes through on a regular basis (cuts, scrapes and bruises) – healing is going to be at its fastest when you’re mentally and physically well-rested and properly nourished. If you know you don’t get your recommended amount of daily fruit and vegetables, it may definitely be worth supplementing with a good multivitamin to try and boost your bodies healing properties as best as possible. Nature's Way Al﻿﻿ive! is my favorite multivitamin. It gives an extremely well-balanced dosage of all required vitamins and minerals needed for you skin heal heal as well and as quickly as possible after going though a traumatic event such as getting a tattoo. Its immune system boosting properties are also great, especially to get you through the first few days straight after having your tattoo finished when your immune system is at it's lowest. 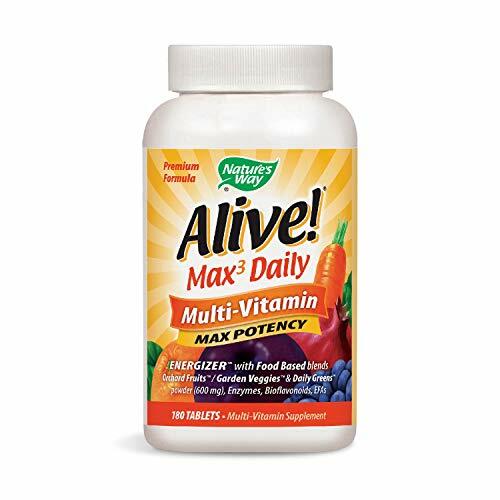 This multivitamin is especially good if you know that you don't get your recommended fruit/vegetable dosage everyday. 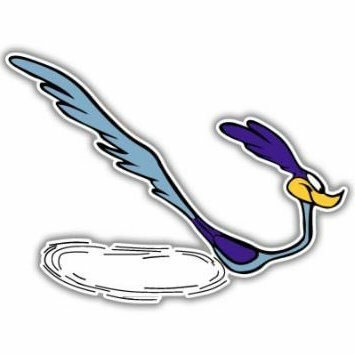 Please note that if you are currently unwell or have any ongoing health/medical conditions, your immune system is likely to be running lower than normal, and therefore your new tattoo may heal a little (or a lot) slower than what it would do with a full-strength immune system, depending on your condition. I know this is the last thing you want to do if you’re excited about getting your new tattoo, but if you're currently fighting a short-term illness (like a cold or flu), it is sometimes better to postpone your appointment and wait until the illness has passed. Not only will your tattoo likely heal faster/better, but you will also minimize the risk of passing your plague onto somebody else at the studio. If you have any serious ongoing health conditions, it is always strongly advisable to seek advice from a medical expert before getting a tattoo. This is to ensure the tattooing process will not cause any adverse health effects by making your immune system any weaker than it already is, which will thus make you more susceptible to further illness and infection. It’s not advisable to go to the gym or conduct any vigorous activity for at least a couple of days after getting a new tattoo. Your immune system will probably be slightly weakened, and overdoing it can add delays to healing. Gyms and many places of work can also be very dirty, so ensure your tattoo is covered well to minimize the risk of infection. Once home, clean your tattoo well. 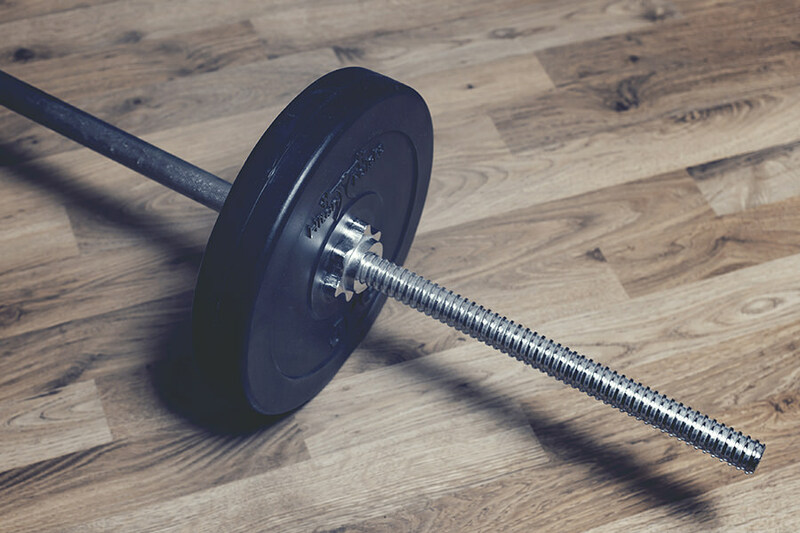 Weightlifting and cardio can also cause your tattoo to rub against clothing, which can cause rashes and sores to develop, so watch out for this too. Sometimes the healing process will go slightly worse than hoped. Maybe you've applied too much ointment and that has drawn ink out, or maybe your skin hasn't reacted so well to the ink and some of the color has been lost. Any of the above scenarios could likely prompt a trip back to the chair of pain for a touchup, in order to go over all the little bits that may not have turned out exactly how you would have liked. Obviously, this is going to add to your healing times, as essentially some parts of your tattoo will need to heal twice (pre and post touchup). Petroleum-based ointments can suffocate a tattoo if used too generously, which can increase healing times. Keeping a tattoo wrapped for too long can also cause the same problem. Any type of infection is going to delay healing considerably. 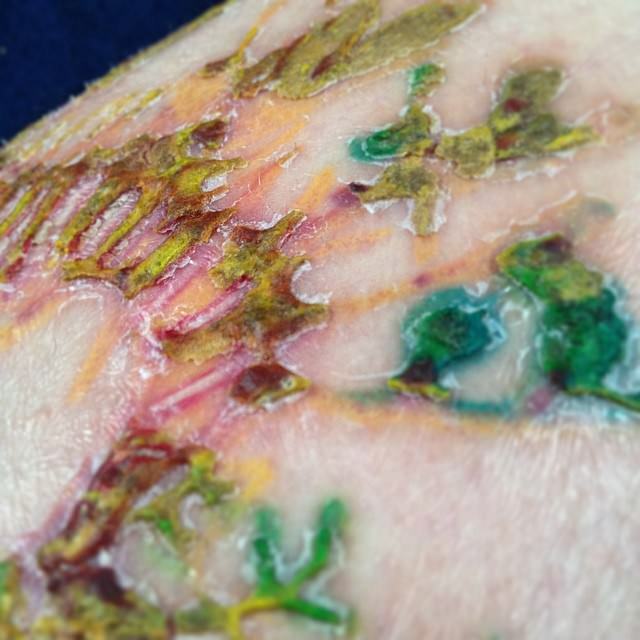 We have further information on tattoo infections, symptoms, and prevention here. So - how long does it take for a tattoo to heal? I hope you can now see why this is such a tough question to answer. I also hope this article helps to shed some light on all of the different ways in which certain scenarios can affect the healing of your lovely new tattoo.